MAN Diesel & Turbo is a world market leader in the supply of large Diesel and Turbo engines for use in ships and power stations. The company employs more than 12,500 people in over 150 countries – covering four Strategic Business Units: Engines & Marine Systems, Power Plants, Turbomachinery and After Sales. A spirit of innovation continues to characterise the company today – making MAN Diesel & Turbo a technological leader in this sector. From entire machine trains to single engine units and components, the huge range of products and services supplied by MAN Diesel & Turbo to their customers and subsidiaries worldwide presents unique and diverse distribution challenges. The digitally printed multilevel labels from inotec fulfilled all requirements. For the past year, they have been used throughout the operation enabling forklift drivers to accurately scan and capture location and load data at ground level. 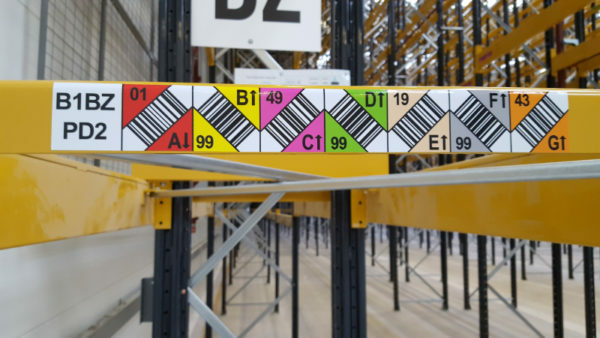 Incorporating inotec’s oblique barcode technology, scan speed and accuracy were further enhanced, the angled barcodes ensuring only the correct barcode was scanned. MAN Diesel & Turbo Operatives and Foremen were involved at each stage of the process, having input into the design and layout of the finished labels and choosing the reading devices. This created added acceptance for the mobile data capture technology and ownership of the project among staff. explained Malte Sietz, Logistics Manager, in charge of planning and logistics at MAN. The involvement of the staff during the decision-making process has contributed to the success of this project and as a result, there have been no problems or issues with the use of the scanners.